This recent interview of the Chinese owner of a flip flop factory based in Tanzania offers some interesting insights into the mindset of the East African consumer. Trade in commodities has been the dominant feature of China-Africa relations over the past 20 years, but many traders, particularly those who arrived in Africa early, are now well aware that there must be more to the relationship than that. 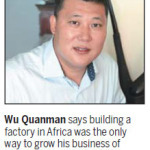 “It’s very important to set up a factory in Africa to ensure that one’s products have staying power in this market,” says Wu Quanman, owner of Li Lai International in Dar es Salaam, which makes flip-flops. 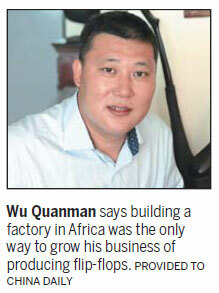 He first came to Africa in 1998, to Rwanda, and moved to Uganda in 2000, and set up the factory in Tanzania in 2006. With a bit of search, I was able to dig up this BBC article from 2006 about the state of the flip flop market in Tanzania. But at Tanzania’s only flip-flop factory, these are dog days. A few years ago 3,000 people worked at OK Plast and their wares were exported to 22 countries across the region. Today the factory employs just 1,000 and Fadl Ghaddar, the Lebanese general manager, told me it was struggling to break even. All but a few varieties of Africa’s flip flops now come from China and local companies cannot compete. It made me wonder whether he’d purchased the struggling factory mentioned in the older BBC article and how he turned it around? Even if he didn’t purchase that factory, his business was apparently booming as the interview quotes him on his plans to invest in local manufacture of the materials required for making flip flops. One valuable lesson Wu learned in Uganda came directly from the customers. Wu says they complained every time they were given products that they were unfamiliar with, and it was decided that if the business was to be sustainable, it needed to sell a well-known brand. There are a couple of insights here that are interesting. The first is the importance of a brand, or rather, a reliable way to identify a consistent product that had been “tried and trusted” i.e. the familiar and known. This also makes me wonder why the original local factory was unable to compete and was struggling. Was it that they were accustomed to pricing high in a seller’s market and then unable to offer a wider range of patterns when the market first flooded with Chinese imports? Or was it that they had not invested in building an established brand? We may never find out but the snippet leaves me with the feeling there’s a story behind it. The other interesting insight from this interview is the fact that customers “complained every time they were given products that they were unfamiliar with” … there is nuance in here whose further exploration will be critical for consumer product companies accustomed to pushing “New and Improved” every so often to increase their market share. If this reluctance to embrace the unfamiliar and/or unknown is simply a matter of unreliable product quality – a common factor of bulk Chinese imports sourced primarily on price – then global brands can rest assured their systems are in place to meet the expectation of this emerging consumer market. But if this preference is for the tried and trusted, the familiar and known, and may possibly imply that the consumers are not enamoured of the “new and improved” then this characteristic is worth noting for those seeking to enter these markets successfully.